Based on the PSVita Game. The Official website for the anime adaptation of the dating sim Game “Kenka Banchou Otome: Girl Beats Boys” has uploaded it´s first video. The anime will premier this Spring. 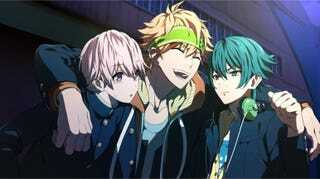 The voice actors will retake their roles as their characters in the PSVita game. Noriaki Saito (Log Horizon) is directing the anime at Studios Project N0.9 and A-Real; Natsuko Takahashi (My Love Story!!) is in charge of series composition. “For as long as she’s been aware, the heroine, without a single relative, lived under care of the state. Both of her parents’ faces were unknown to her. In front of this heroine, a young boy appeared. The young boy’s name was “Hikaru.” It appeared that he was the heroine’s twin brother, separated at birth. He had a proposal for the heroine.